27, 6, 18, 25, 48, 59, 98, 34. Find Huffman codes for the same. (10 marks) 4 (a) Describe 0/1 knapsack problem. How to solve it using branch and bound? (10 marks) 4 (b) Write an algorithm for binary search. Derive its best case and worst case complexities. 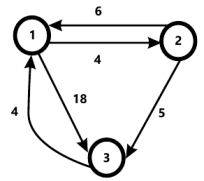 (10 marks) 5 (a) For the following graph find all pairs shortest path using dynamic programming.